As every garden room we install is a bespoke design, pricing is very much dependent on the choices you make for your final build specification and layout. Factors such as the overall size, external cladding, internal finish and your window and doors choices all contribute the the overall pricing. We can often help with changes and suggestions that can be made to your design, to match with your budget expectations. 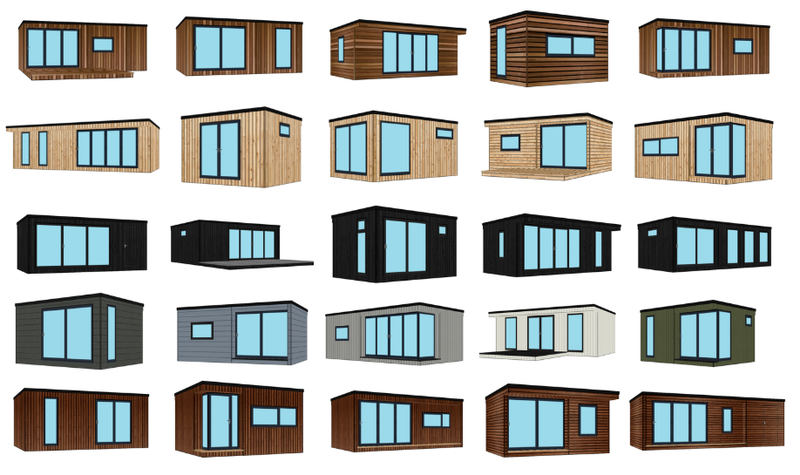 To give you an idea of pricing we have put together some example designs with a range of cladding materials and design options to view, or alternatively you can configure from scratch in our online 3D configurator. If you would like us to provide outline pricing based on your initial ideas for your garden room, please complete our initial consultation form below. View priced design examples, layouts and build specifications to see what we can offer. All prices include foundations, delivery, waste removal, electrical connection and VAT, there are no hidden charges. Each design example can be viewed and modified in the 3D configurator, if you find a design of interest you can submit this to us before arranging a site survey. Priced example designs featuring different cladding materials, window and door configurations, layouts and design options. In our online 3D configurator five necessary design elements, building size, layout style, foundations, exterior cladding material and entrance door can be selected to provide you with and install price estimate for your new insulated garden room. Nine further design elements can be selected as required to customise your new space, with specialist options for gyms and music studios. Your initial thoughts can then be submitted to us, before arranging a site survey. Our garden room install prices are built up from the different design elements that you can specify for your new garden room. You are free to choose which parts of your new garden room are the most important to you, trying out different options to suit your individual requirements and budget. Submit an online consultation form to provide us with your initial thoughts for your new garden room space. We can then provide outline pricing based on the information you have provided. If the pricing is of interest we can then arrange a site survey to view your site, show you some material samples and help to finalise your design and specification. If you have a design in mind and possibly a drawing, this is also the place to start. A great place to start the process to your custom garden room space. Reading our garden room options guide, provides you with an understanding of what we can offer. In our design options guide shows what we can offer and provides you with the information required to make informed decisions for your new garden room.